RECORD TEAM TOURNAMENT: A record 104 teams toed the line for the 19th "run for the slivers" at the 2009 WBC and when the cavalry charge had ended, three remained deadlocked at the top of the heap with 23 points each thanks to three bonus points awarded to those who had not won their event previously. The 3rd-rated '99 champions Me & Three Stiffs were originally alone in the lead before the 6th-ranked James Gang and 3 Men & a Canadian were boistered by one and two bonus points respectively to knot the score at 23-all. Thus deadlocked, the title would be decided by the total entrant tie-breaker where the 17th-ranked 3 Men & a Canadian squad enjoyed a clear advantage with an average entrant size of 50.75 to 31.25 for Me & 3 Stiffs and 28.75 for The James Gang. Finishing 4th were the prohibitive favorites, three-time champion Nest of Spies who fell victim to cannibalism when Stefan Mecay downed teammate David Dockter in the POG Final to prevent a fourth title for the perennial champs. However, they joined the 2009 champions in being the only two teams to score with every team member—proving once again why they are the team to beat—year after year. Complete details for the 2009 Team Tournament are available on the website. Mark Love posted a winning % of 60% in our initial "Pick the Top Ten" Team Tournament contest. Mark won a free 2010 membership by correctly selecting all four of the top four teams with his first five picks and then added Sweep the Leg and Fields of Glory to round out his entry with six correct selections. Move over Happy Handicapper! AUCTION RESULTS POSTED: The WBC’s Auction and Auction Store again enjoyed record sales as pre-registered lots were at an all time high. Overall, auction sales were up 15% with 600 lots. All lots sold as the quality of the items in the auction continued to improve. Only 76 items (13%) went for $10 or less. The average price per lot came in at $32.77, slightly above last year’s $31.96. More details and complete sales figures for both the 2009 Auction and Auction Store are now posted. MARCH MADNESS: The 7th BPA March Madness PBeM tournament is set to begin Nov. 1, 2009. Last year’s event again drew 38 entrants and 37 of them are already back for another shot. The two teams in the final game were seeded #9 and #25 seed, showing that any team has the chance to win this tournament. The tournament format will be two single elimination brackets. Each player will receive one team in each bracket. 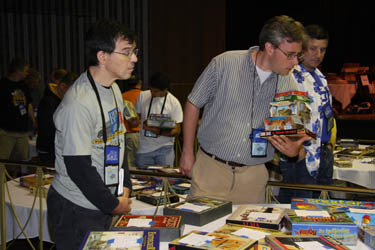 A random die roll will determine the order in which the players draft their teams. The draft order will be reversed for the two brackets. There will be a 5 week time limit on each game so a game can be completed if each of the players does a turn per day. Most games will finish in less than one month; many finish in less than a week. Since these are single elimination brackets new games will start as soon as the opponents are both available. Check out the details. To sign up, email Bruce Monnin at bdmonnin@nktelco.net. VICTORY IN THE PACIFIC: Don’t get caught with your battleships in a row when Pearl Harbor Day comes early this year on Sept. 15. Single-elimination tournament action begins that evening. You can join throughout September, but join quickly or risk being in bed in your jammies when the air raid sirens sound! Contact John Pack at john@gameaholics.com to join. Get all the details at http://www.gameaholics.com/vitp_tournament.htm! ADEL VERPFLICHTET/BY HOOK OR BY CROOK/HOITY TOITY: Fabulous collectibles go on sale and display on Oct. 1. The SpielByWeb interface makes it easy to play. Five preliminary games with a new one starting every three weeks lead up to a semi-final for the Top 10. Contact John Pack at john@gameaholics.com to join. Get all the details. WAR AT SEA ENTERS SECOND ROUND: The final 32 players have been established AND 11 of these 16 spots have already been claimed. Robert Drozd and Bruce Reiff have advanced into two of the final eight spots on the bracket. For details, see the event webpage. Last updated 10/1/09 by kae.